Farrar, Straus and Giroux (BYR), 9780374388195, 40pp. 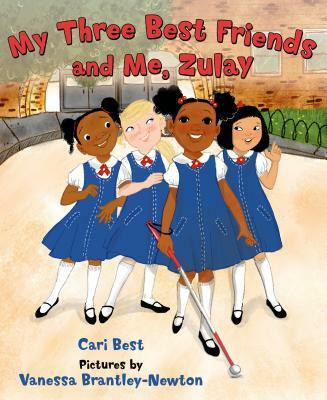 Zulay and her three best friends are all in the same first grade class and study the same things, even though Zulay is blind. When their teacher asks her students what activity they want to do on Field Day, Zulay surprises everyone when she says she wants to run a race. With the help of a special aide and the support of her friends, Zulay does just that. Cari Best has written many award-winning picture books, including Sally Jean, the Bicycle Queen, a School Library Journal Best Book of the Year; and My Three Best Friends and Me, described by the New York Times as “refreshing” and “exciting.” Her picture book If I Could Drive, Mama was described by Publishers Weekly as “a wonderful tribute to an imagination in perpetual motion.” In the Country of Queens is her first novel. Ms. Best lives in Connecticut. Vanessa Brantley-Newton is the writer and/or illustrator of many picture books, including One Love, based on the Bob Marley song. Ms. Newton lives in Charlotte, North Carolina.